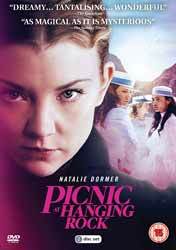 In 1900, on an innocuous picnic trip to hanging rock, a group of young women and their teacher go missing. The disappearances throw the sleepy town into confusion, with many believing that foul play was involved. The question is who could be responsible for such a heinous crime? Picnic at Hanging Rock (2017. 6 eps x 50 min) is a television adaptation of Joan Lindsay’s novel. It had previously been highly successfully adapted in 1975 by director Peter Weir. This version was adapted by Beatrix Christian and Alice Addison, directed by Michael Rymer, Larysa Kondracki and Amanda Brotchie. The story opens with Hester Appleyard (Natalie Dormer) purchasing a large mansion to change into a finishing school for young ladies. Immediately there is a strange dissonance with the character. While she speaks to the estate agent in a very posh accent the audience can hear her inner thoughts in cockney. The lady is not what she appears to be. The story shoots forward to the fateful day, St Valentines 1900, when the girls are on their picnic, resulting in three of them disappearing along with their teacher. As the fall out from the event moves forward many of the town’s folks’ secrets are slowly revealed. The layers of lies are peeled back to uncover a Lynchian level of blackness beneath the apparent normality of the town and school. The story shifts back and forward from the day of the disappearance slowly revealing, sort of, what happened to the girls. I say sort of as they come near to including the missing chapter. When the book was originally published it was presented as if recounting real events. However, Lindsay was advised to cut the last chapter which revealed that the teacher turns into a lizard and leads the girls through a space/time vortex. The last chapter was reinstated for later editions but even this show was not brave enough to end the story on such a bonkers note, preferring, like Weir, to leave the disappearances a mystery. The show is part thriller, offering up many possible suspects in the girls’ disappearances as the town cracks under scrutiny. One of the nice things about this adaptation is that it could include much more of the book than Weir's film was able. Dormer is suitably weird, savage and more than a little mad as Ms Appleyard. They have kept the esoteric look of Weir's film, with the girls wearing a lot of white to emphasis their virginity, while at the same time the show explores the power of their repressed womanhood and sexuality. At one point they literally take off their corsets, the symbol of their repression and throw them down the mountain. The show was offered up as a screener, so the quality was ok, but not stunning, a Blu-ray release would have done the show more credit. But the two-disc DVD set does come with some extras. You get an interview with Natalie Dorma (11 min, 55 sec) who talks extensively about the show. You also get a short (1 min, 47 sec) interview with Inez Curro, who plays Sara, in fact you get a lot of short to camera pieces. There is a collective interview with Lilly Sullivan (1 min, 18 sec) who plays Miranda Reid, Madeleine Madden (Marion, Quade) who disuse their belief that they think that the girls disappeared just like the missing chapter said. There is an interview with Samara Weaving (Irma Leopold) discussing her favourite scenes. You get another short (1 min, 58 sec) and then one with the writer Alice Addison (2 min, 03 sec) talking about adapting such a well-loved book. There’s a longer piece (12 min, 08 sec) with the producer, Jo Porter and shorter ones (2 min, 44 sec) with the director, Jo Ford (1 min, 15 sec) with the costume designer and Brett Popplewell (1 min, 42 sec + 3 min 22 sec) producer. Overall, it's a good adaptation of the book.